The scene near Campo on Wednesday. A Border Patrol agent fired shots at a suspect in Campo Wednesday morning, the San Diego County Sheriff’s Department confirmed. According to investigators, Border Patrol agents encountered two cars traveling north from the U.S.-Mexico border near Campo at around 6:45 a.m.
One of the vehicles turned back south, and the occupants then abandoned the car at the border fence and absconded into Mexico, officials said. The driver of the second vehicle stopped for a moment on the side of Forrest Gate Road and agents started to exit their vehicle to approach the driver. 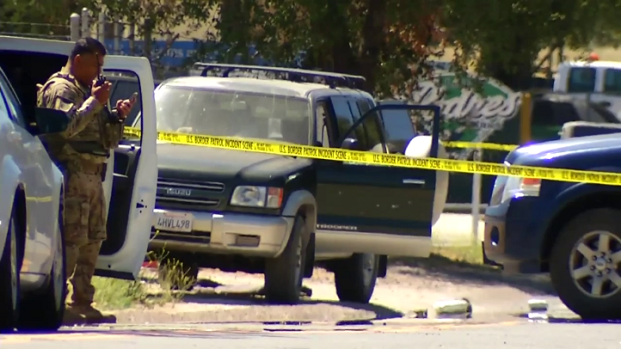 A Border Patrol agent shot at a suspect in Campo Wednesday morning after the suspect allegedly drove his vehicle toward the agent. NBC 7's Greg Bledsoe reports. That’s when officials say the driver of the suspect vehicle made a U-turn and drove directly toward one of the agents. Fearing for his life, the Border Patrol agent fired his duty weapon at the suspect vehicle and the car soon came to a stop. Officials say the driver inside the car sustained non-life threatening injuries from flying glass. He was transported to a hospital and then taken into custody by U.S. Border Patrol. No agents were injured in the shooting, which happened approximately 50 to 100 feet from a Border Patrol station. The names of the suspect and agent involved in the shooting were not released. Investigators say both suspect vehicles involved in Wednesday’s incident were carrying a large quantity of suspected drugs. Investigators have not yet said what type of narcotics, or the exact amount, but San Diego Sheriff’s Lt. Giannantonio estimated it was in the hundreds of pounds. Law enforcement officers investigated the agent-involved shooting all morning near Campo. Crime scene tape blocked off Forrest Gate Road at State Route-94, while U.S. Border Patrol vehicles blocked off the road from traffic. An Isuzu trooper with multiple bullet holes and a smashed-in window was stalled at the scene. Several bundles of suspected narcotics could be seen on the ground next to the vehicle. Earlier in the day, Cal Fire reported via Twitter that the FBI was investigating a shooting in the area involving U.S. Border Patrol employees. San Diego County sheriff's deputies were also on scene. Campo resident Raymond Santiago told NBC 7 he heard multiple shots in the area Wednesday morning around 6 a.m.
“I heard some shots and I opened the window and I didn’t think anything of it. [I heard] just rapid shots, about six or seven,” said Santiago. Campo resident Malena Arizpe also said she heard gunshots. After the shooting, nearby Campo Elementary School was briefly placed on precautionary lockdown around 8 a.m., a school superintendent said. A staffer said the lockdown was lifted around 9:30 a.m. at the elementary school located on Buckman Springs Road north of SR-94. The superintendent told NBC 7 San Diego the shooting was related to a Border Patrol incident and stressed that no shots were fired on school grounds.